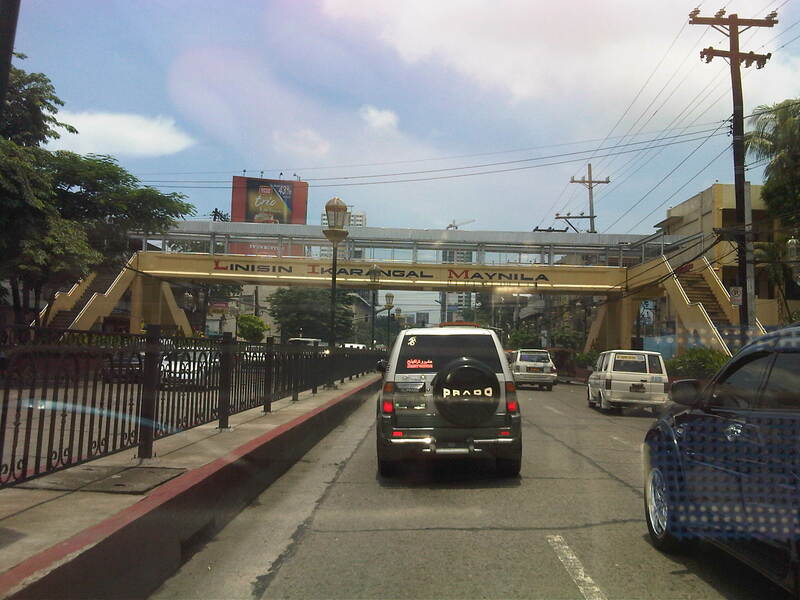 I took some photos of pedestrian overpasses along Espana Avenue in Manila while en route to a meeting in Malacanang. I was hoping to capture the conditions along such facilities and maybe compare them with my observations along Commonwealth Avenue. Following are photos taken from my trusty Blackberry. I ask my readers to excuse the reflections due to the sun bearing down on the windshield of our vehicle. 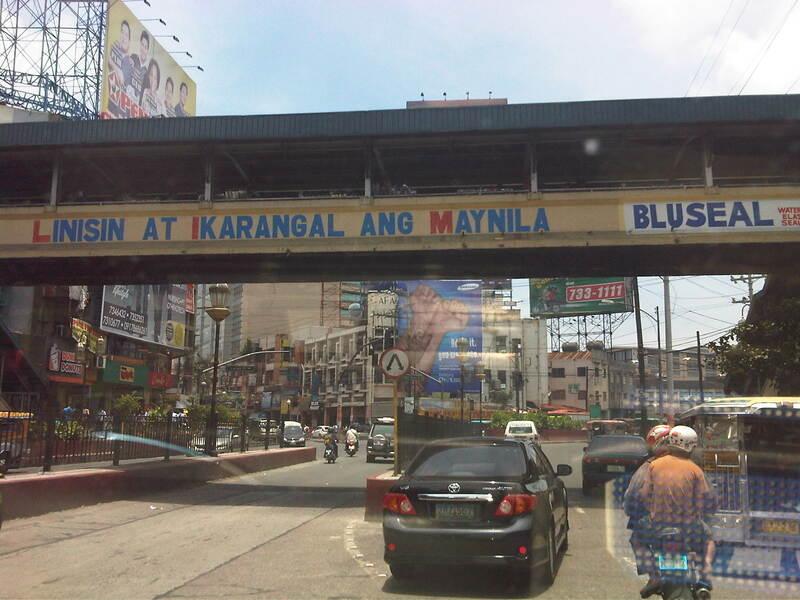 Steel overpass built during the last MMDA administration. Many pedestrian overpasses were constructed out of steel by the MMDA and this was attributed (allegedly) to the previous Chair having a construction and steel manufacturing outfit. True enough, many of these structures bear his initials that is also the name of his corporation. Many of these structures were criticized by the DPWH for not following standards (e.g., one can feel the deflection of the overpass while traversing its length) but the same agency seemed helpless in their case against such facilities. 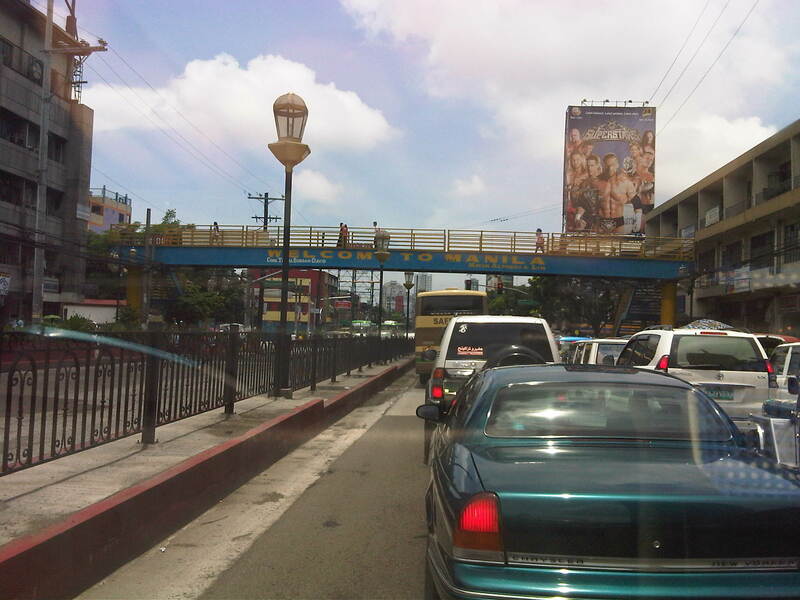 Older concrete overpass across Ramon Magsaysay School. This appeared to be clear of vendors while the roof structure is unfinished giving users no protection from the elements. Overpass across UST. This is one of the older and larger (widest?) pedestrian facilities along Espana considering it serves the students of one of the largest (in terms of population) universities in the country. There are vendors on this overpass but mostly those selling candies and cigarettes(!). I am not sure if UST has posted a guard along this overpass considering the safety and security interests of its constituents. Similarly situated overpasses along Katipunan Avenue are secured by personnel provided by Ateneo De Manila University and Miriam College. 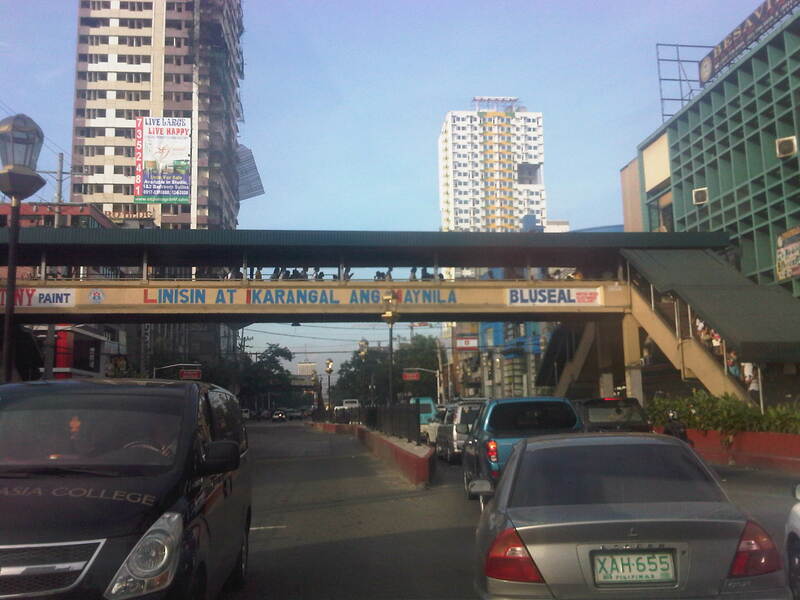 I would like to see this overpass retrofitted and re-designed to match UST’s heritage. The institution, after all, just celebrated its 400th anniversary. Overpass at P. Noval Street. It is not so clear from the photo but one can easily see vendors with their wares set-up along the overpass and clogging the flow of people. This is another relatively old structure as this is a major crossing point for people in studying or working in the University Belt. Another look at the P. Noval overpass from the Quezon City-bound side of Espana. Notice the high volume of pedestrians using the overpass? Most of these are students studying at one of the universities at U-belt or graduates reviewing for their respective licensure exams in one of the many review centers located in the area. There are many nursing and engineering review schools in the area. If we are to encourage walking as a mode of transport and especially applicable to short distance trips, we would need to invest and build the necessary pedestrian facilities. Such facilities need to be structurally sound and therefore compliant with the standards set by the DPWH and properly located to encourage their use. Design, of course, includes capacity considerations since they should be able to accommodate volumes of pedestrians during peak periods. As such, overpasses would have to be clear of vendors or others that constrict flow. Ideally, pedestrian facilities should also be designed according to a criteria that includes aesthetics that adheres with the character of the area where it is located. It is understandable that construction of such facilities may have been rushed due to the urgency of the situation (i.e., like in the case of Commonwealth). Nevertheless, while the intent is good, the execution of the solution should still adhere with standards considering that these are often long-term investments for public infrastructure. By d0ctrine in Infrastructure, Pedestrian, Walking on September 5, 2011 .
pinaka maganda pa rin sa pedestrians ang on grade. anything that goes up or down is extra effort. it should be done only on the busiest highways. apart from being expensive they also block views. I agree. We have many overpasses that aren’t used for a variety of reasons including some being too steep or even too short. Sadly, overpasses are popular because of their cost and the negatives attributed to their being sponsored by politicians. You may use the photos posted in this blog. However, for reference/credits purposes, I encourage you to refer to or identify where you got the photos. 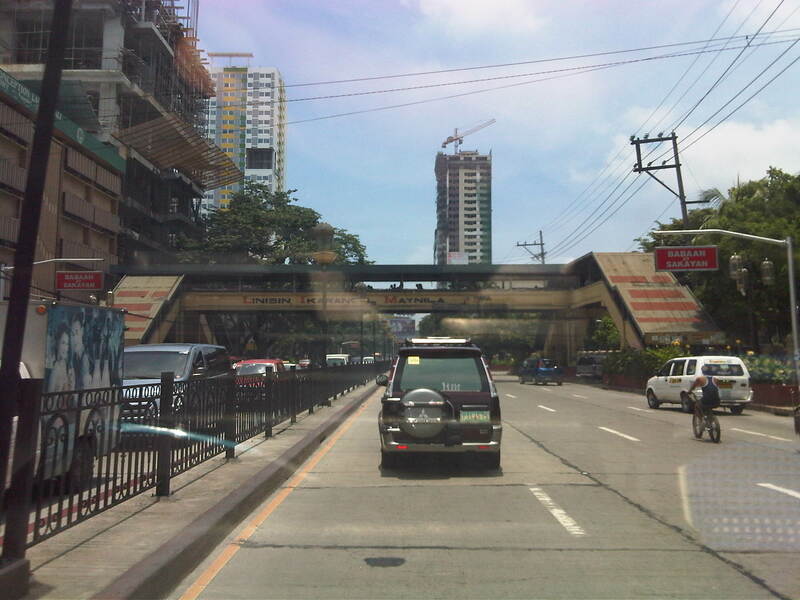 For designs, the DPWH has a design manual and specifications for overpasses.